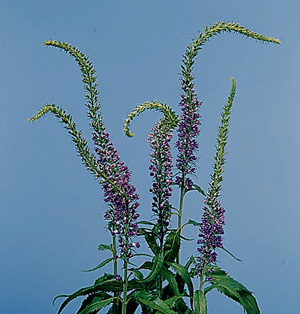 Home|Floral Library|Speedwell – Veronica longifolia and V. spp. As a field-grown flower, may not overwinter well in certain areas. Some common relatives include calceolaria, snapdragon, foxglove, monkeyflower and penstemon. Has many small flowers in terminal columnar clusters, 3-6 inches long. Stems up to 24 inches long. Hold at 36-41F for limited time, long-term storage not recommended. The name Veronica derives from the resemblance of the flower to the markings on the handkerchief of St. Veronica. The specific epithet name “longifolia” means long-leafed.